The last Apple Pie I baked turned out great but it didn't have enough filling. I tried again last weekend and used 8 apples this time (double). It turned out quite well except for the bottom crust which was slightly soft as I probably took too much time to prepare the lattice for the top of the crust while the filling was already in. I should have cut the pastry stripes first before filling the pie so that the filing wouldn't have to sit for too long on the pastry before baking. Brush a 23 cm diameter pie dish with melted butter or oil. Sift the flour and salt into a large bowl. Cut in the butter until the mixture resembles coarse crumbs. Mix the water and vinegar together in a cup. Add the mixture to the crumbs. Mix together just until the dough is combined and handles well. Turn onto a lightly floured surface and knead briefly to form a smooth dough. Divide the pastry into 2 portions, one slightly larger than the other. Roll the larger portion between 2 sheets of baking paper to fit into the pie dish and trim the edges. Roll the remaining pastry on a sheet of baking paper to fit the top of the dish. Cover both pastries and refrigerate for 15 minutes. Combine the apples, sugar, water, cinnamon and cloves in a large pan. Cover and cook over low heat, stirring occasionally, for 10 minutes or until just softened. Remove pan from heat and pour off any excess juice. Remove cloves from pan. Add butter to pan, mix gently and sea aside to cool. Cut another pastries into 16 strips, each about 1/2 inch wide. 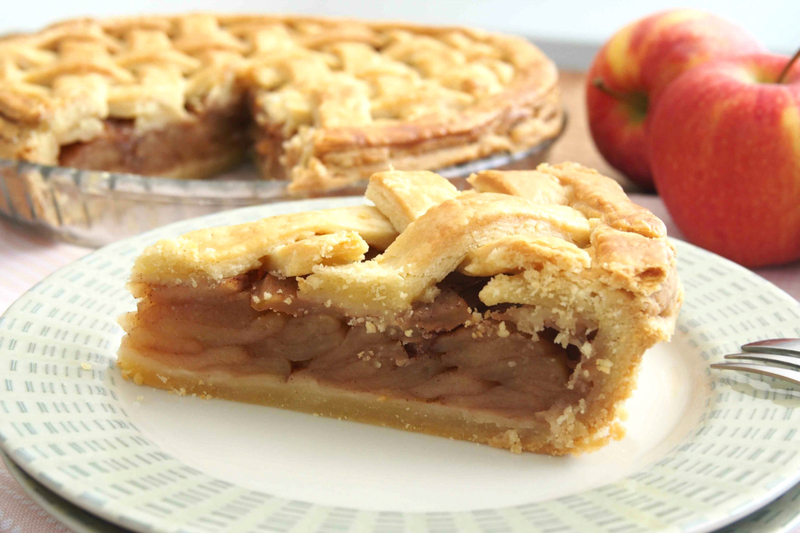 Pile the apples evenly into the pastry-lined pie dish. Place 8 strips across filling in pie plate. Weave a cross-strip through by first folding back every other strip of the first 8 strips. Continue weaving, folding back alternate strips before adding each cross-strip, until lattice is complete. Trim the edges of the strips flush with the dough of the underlying pie dish, which should be about half an inch over the sides. Fold back the rim of the shell over the edge of the lattice strips, and crimp to secure with fork. Brush lightly with milk and egg white mixture. Bake 30 to 35 minutes or until pastry is golden brown. 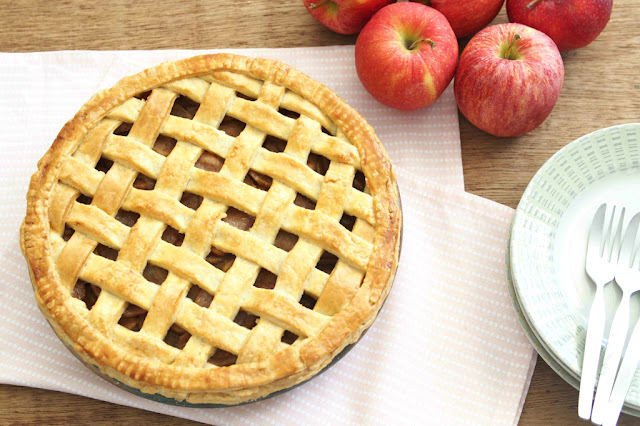 Please visit here "how to lattice pie crust"
Hi good afternoon, can we use red apple in this recipe instead of green apple? Thank you for dropping by. Yes, you can. 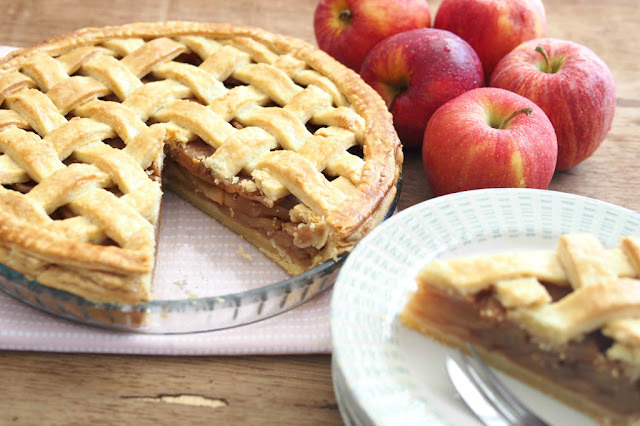 You are not required to cook the apple first if you prefer to have more texture of the apple. Just toss all the ingredients together, omit water and whole cloves.